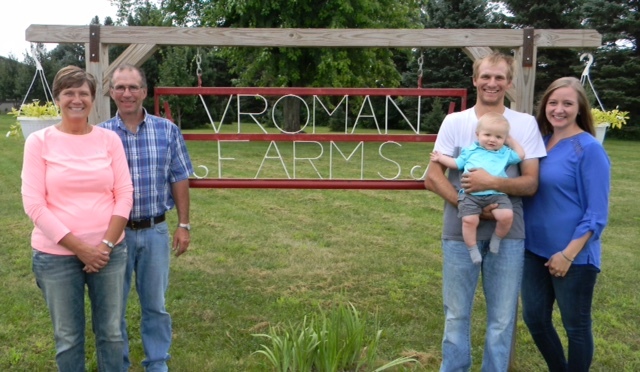 For more than thirty years, Dean Vroman has been raising crops, pigs, and cattle in Minnesota. While equipment and facilities have been important, his most valuable investment has most likely been the relationships he’s built with farmers and industry professionals that have allowed his farming operation to grow and provide an opportunity for the next generation. Dean grew up on a farm near Milroy, Minnesota, and when he was a senior in high school, he began renting a farm about a mile away from the Vromans’ “home farm.” A few years later he had the opportunity to purchase farmland where he currently lives and farms along with his wife Alice. They have been married for 33 years and have four adult children, Tony, Jackie, Jen and Andrew. Dean has raised pigs through his entire farming career, but his operation has evolved significantly over the years. In 1992, the Vromans built a small farrow-to-finish facility which they operated until last year. Dean invested in the Calumet gilt multiplier barn built by Pipestone System in 1992 and received gilts for his farrowing operation until Pipestone closed operations there. He and a group of other farmers actually purchased the Calumet barn and operated it as a commercial farrow-to-finish barn until about a year ago. After the sale of the Calumet barn, Dean invested in a new Pipestone System sow barn built in South Dakota and expects to receive the first group of isoweans from that barn in September 2018. “We’re excited to be back to getting pigs from a single source of isoweans,” he said. They expect to finish 30,000 pigs in 2019 in a combination of their own nursery and finishing barns as well as working with contract producers. They are constructing a 2,400 head finishing barn and in the process of remodeling the farrow-to-finish barn into a nursery barn. They also raise corn, oats and alfalfa and finish beef cattle at three sites. The Vromans began working with veterinarians from Pipestone Veterinary Services at the same time they invested in the Calumet barn. The relationship has grown and expanded as their operation has over the years. An important resource that Pipestone has provided has been record keeping along with the ability to access benchmark data for grow-finish operations. Dean said it provides a way to compare his operation and performance to peers and the rest of the industry and to find ways to continue improving animal care and performance. He also values relationships built throughout Pipestone. Dean notes that most significant changes during his time farming have been in technology advancements. “New technologies are allowing us to become better stewards of our environment and manage our natural resources in a way that provides the most benefit,” he said, citing examples of being able to monitor barns remotely, using GPS and variable rate technologies to apply fertilizer or plant seeds at exactly the right rate. While all of Dean and Alice’s children had the opportunity to help with the farming operation while growing up, it is their youngest son, Andrew, who had the interest from a young age to follow his dad’s footsteps and to make it his passion. He, along with his wife Courtney, became full-time partners in the business about four years ago. They have a young son, Oliver, who has already been exposed to chores and is sure to be given the opportunity to contribute in a meaningful way down the road should he have the interest in doing so.